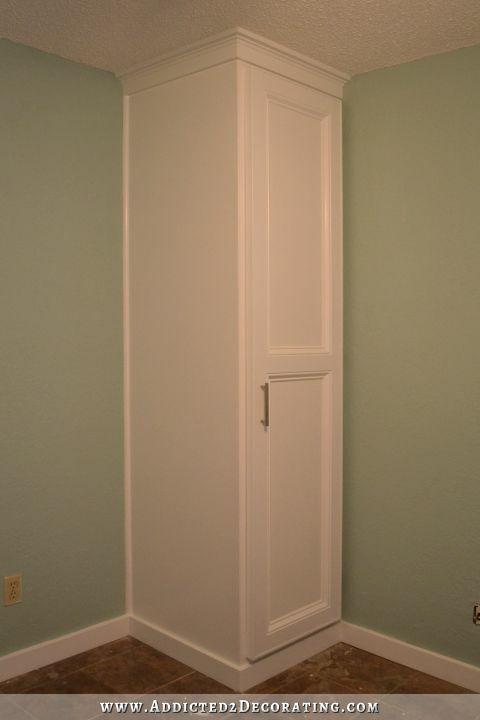 Well, it took a bit longer than I had anticipated, but I finished the built-in closets on Friday evening. 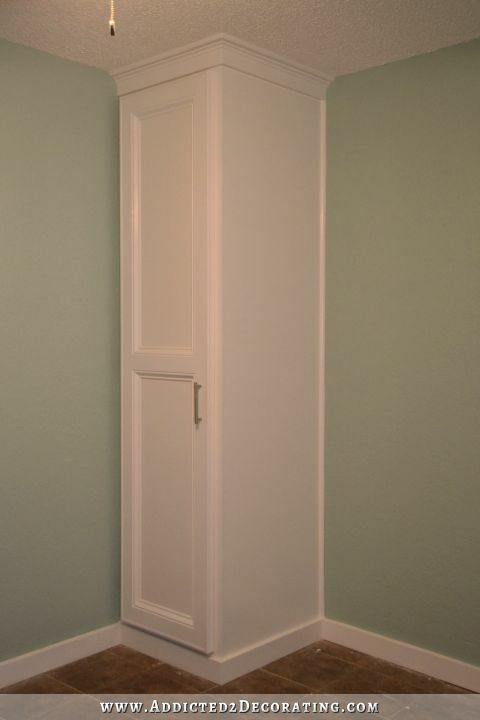 The paint color I used on the closets is Polar Bear by Behr, which has been my go-to trim color for many years now. 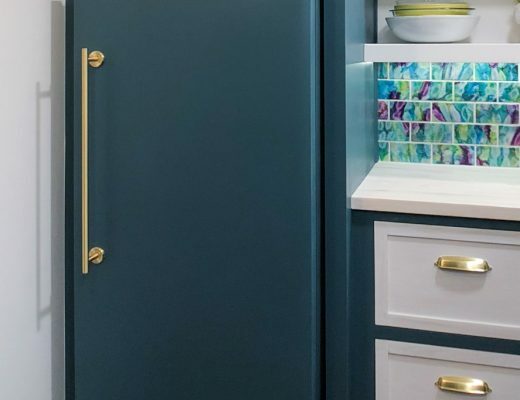 I don’t like stark whites for trim because they can look cold and harsh, and I don’t like whites that have hints of yellow, because they can come a little too close to “antique white” for my taste. This white has just the tiniest, slightest hint of red added to it, so it’s a very warm, creamy white. I’m really proud of how these closets turned out. The quality of the construction is miles above what the original closets were that I started building in here a few years back. 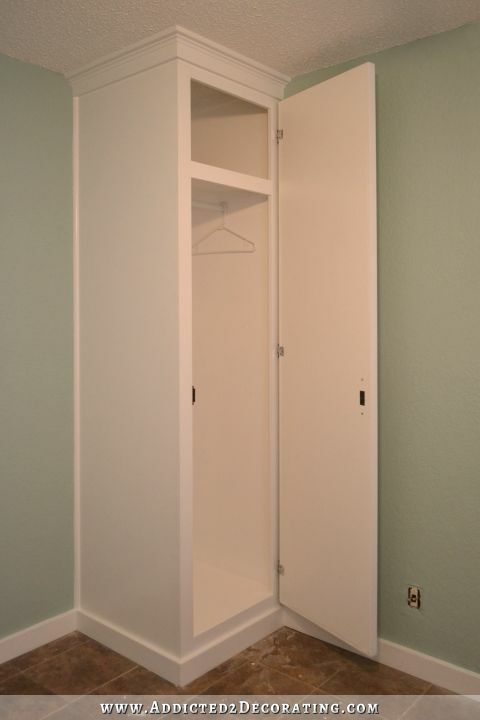 And while these closets aren’t very wide, I think they’ll offer quite a bit of storage. In a condo this size, any additional storage is a huge bonus. In the closet on the right, I added a shelf at the top, and then one hanging bar for longer clothing items. …but the inside is configured with two hanging bars for shorter clothing items. Combined, they offer about 69 inches of hanging storage. That’s over ten inches more than the original closet in this room (which is now shelf and drawer storage). And they ended up costing about $168 each. Not too bad, right? You can see I still have some wallpaper scraping and painting to do on the walls (on the right wall). That’s turned out to be a bigger job than I had hoped, but there’s no turning back now. And I’ve had far worse wallpaper removal experiences, so while this isn’t coming off as easily as I had hoped, it’s still much easier in comparison to removing old wallpaper from unprimed drywall. 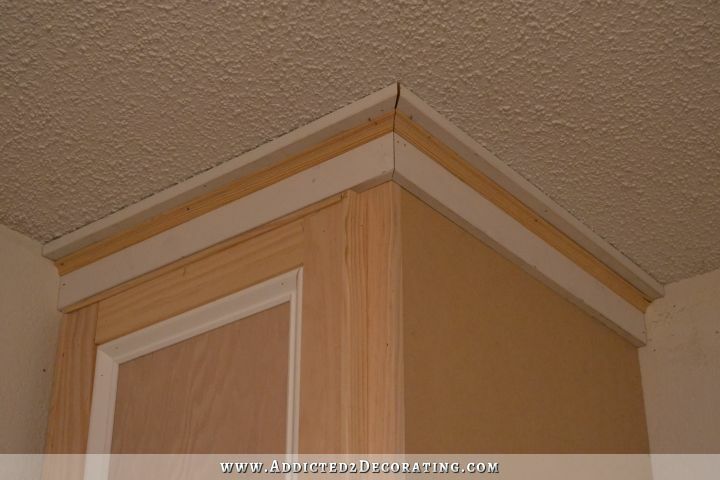 Oh, and remember my not-so-perfect mitered corners on the faux crown moulding? Here’s how it looked after I filled the cracks with wood filler, sanded it smooth, caulked, primed and painted. I’m tellin’ ya…wood filler and caulk are a DIYer’s best friends when it comes to getting a high quality finish on a project with less-than-perfect cuts and joints. And as far as the shelf that I added to the closet on the right, there’s nothing fancy or difficult about it. 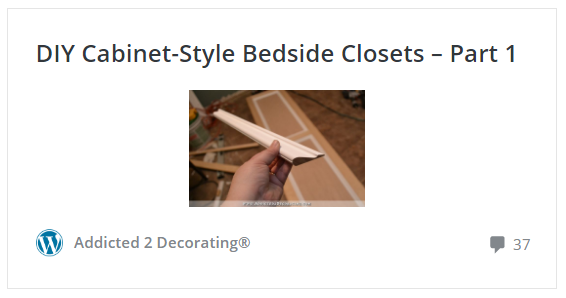 I simply cut three pieces of scrap 1″ x 2″ lumber, and attached those horizontally to the back and the sides of the closet interior using wood glue and my nail gun. Then I cut a piece of 1/2-inch MDF to fit to create the shelf, whch I glued and nailed to the 1″ x 2″ supports. Then I cut a piece of 1″ x 3″ lumber and attached it to the front edge of the shelf. Then with a little wood filling, sanding, and caulking, it blended right in. It feels really good to finally have this project finished. This was the biggest unfinished project in the whole condo, so the rest of my to-do list should feel pretty simple in comparison. UPDATE: This room makeover is complete! 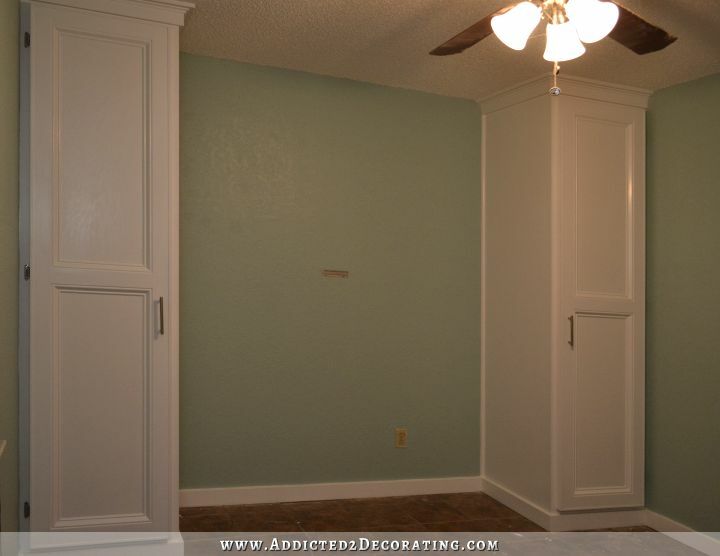 Click here to before and after pictures of this room makeover. 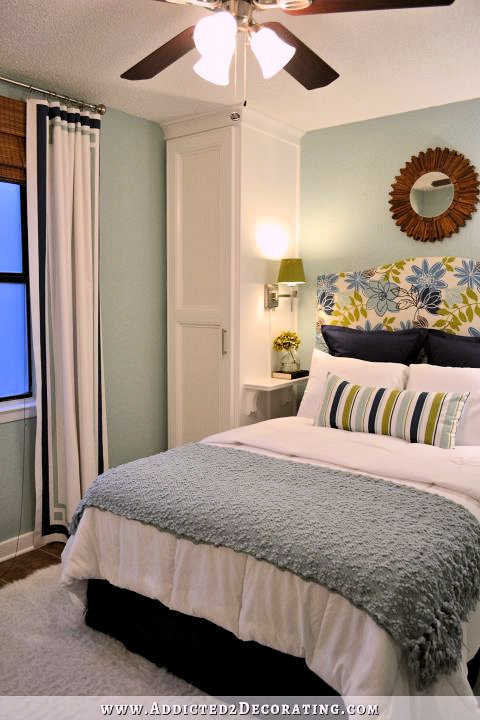 Planning a small bedroom makeover? Don’t forget to save this idea for later! Next Post To Stage Or Not To Stage A Home For Sale? The closets look great ! 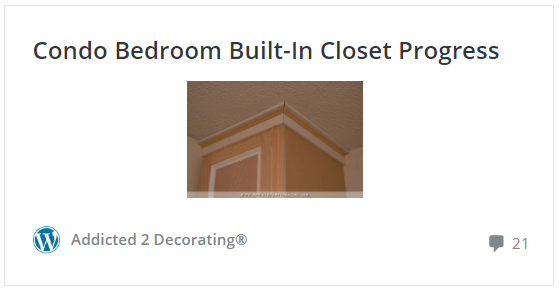 I will be using your idea of triming for the ceiling in my bathroom so thank you SO much for posting in details how to get that done. Any ideas what to use to sand a bath ? Sand a bath? I’m not really sure what you’re asking. I have a very old bath. The heavy kind. 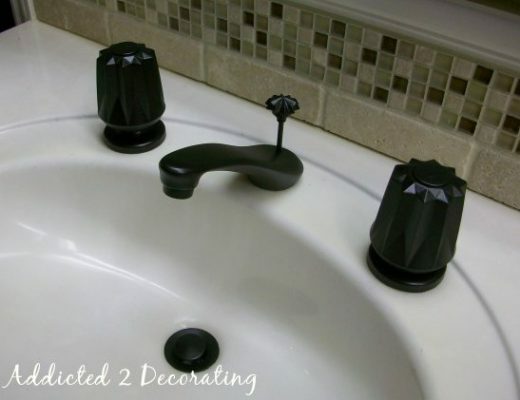 When I bought the house, I tried all sorts to cleaning products to make it look white again. No luck. So, I thought I could sort of paint it but it says to sand it clean first and I am not having much luck. It still looks awful. I was wondering if you knew of something to help me do a better job. I used my sanding machine, the one that is shaped like a triangle ? And a sand paper block. It does make a difference but not a big one. A pumice stone perhaps? I know they make ones for toilets, so I imagine you could use that for your tub as well! Looking great!! I really like how the closets look in the room. I think my favorite part may be the way you did the molding at the top. Perfect! And the finished project looks great. Sure they will be a favorite feature of a future owner. You did yourself proud, again! They look great. And as soon as you get the rest finished, I’m sure there’s an immediate sale. They came out beautifully but then we all knew they would. Somebody will be really blessed to get that condo with all of the added extras you have provided. You amaze me with your talent! The cupboards look fabulous Kristi and I’m sure people will appreciate the extra storage space. I also love the color of the walls. Great job girl! Love them! What is next??????? I love the closets (esp. the crown moulding) but even more the colour you chose for the walls! I hope the next owner will like it as well and keep it so that your effort isn’t wasted. Cannot wait to see what else you’re going to accomplish in the condo in order to get it on the market! Beautiful wall color. Looks really calm and soothing. 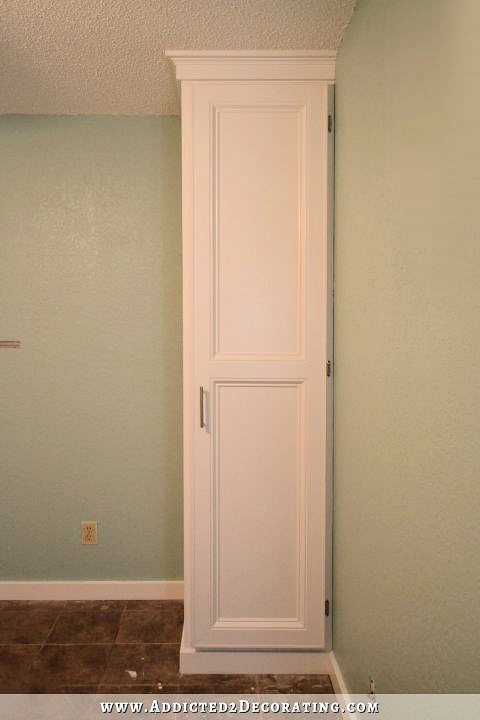 I think it would be cool to put a bookshelf/headboard between the closets. They look really good! 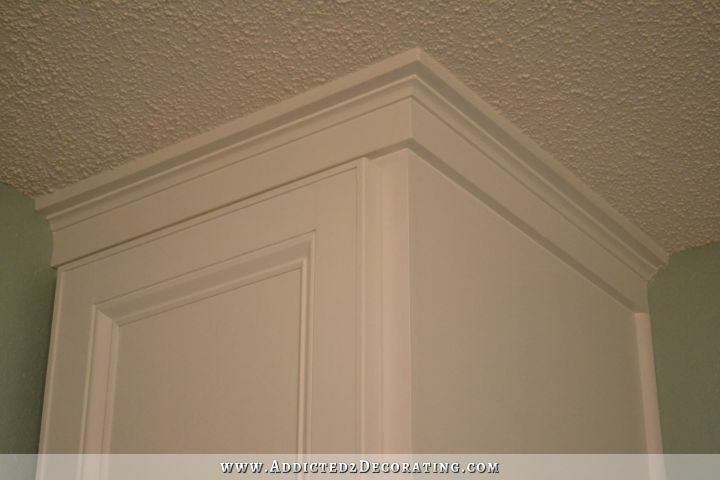 I love the crown molding and the wood filler/caulk fixes– makes it look perfect. I think those are going to work perfectly. Wouldn’t it be great if roommates could buy this condo? Its set up perfectly for two. Well done. These turned out really really nice. You can hang art work ! You are just amazing. Beautiful job! 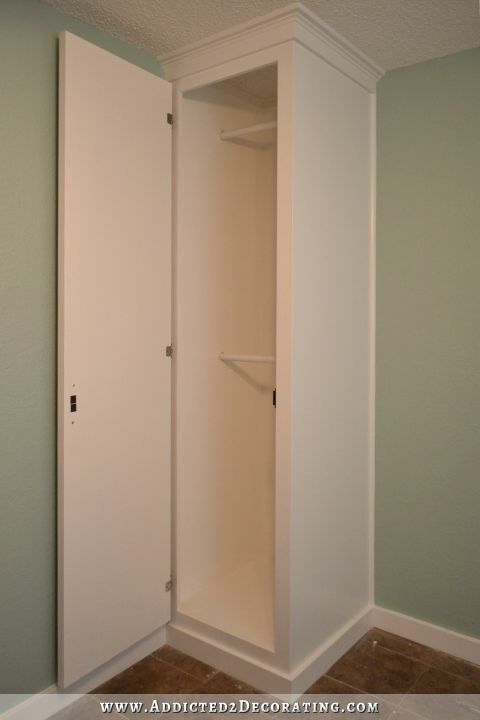 Speaking as a resident of a small apartment in a big city, I can personally testify to how important small closets like these are, and what a major difference they make in livability. And you made them look so very nice! Very nice. Pretty wall color also. 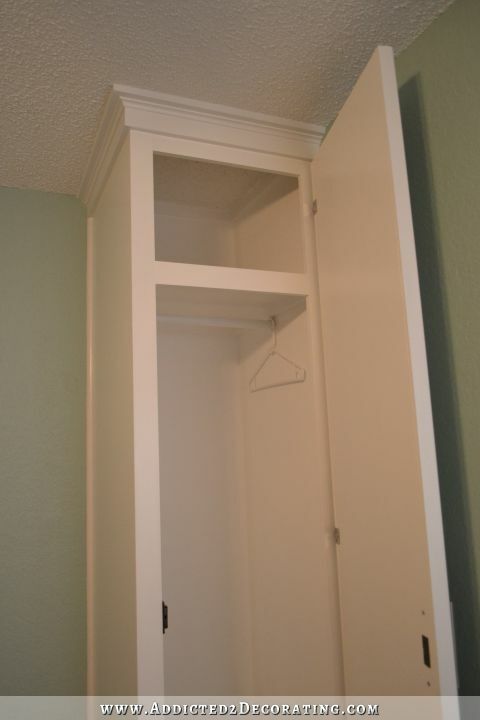 The closets look wonderful and I love the different heights for the hangers. I bet there will be a bidding war for your condo when you are finished! Thank you, too, for sharing the paint colors! Just beautiful! Looks fantastic! You even blended it all into the ceiling. Perhaps you’ve mentioned this before, but: What are your favorite brands of wood filler and caulk, or are they all pretty much the same? 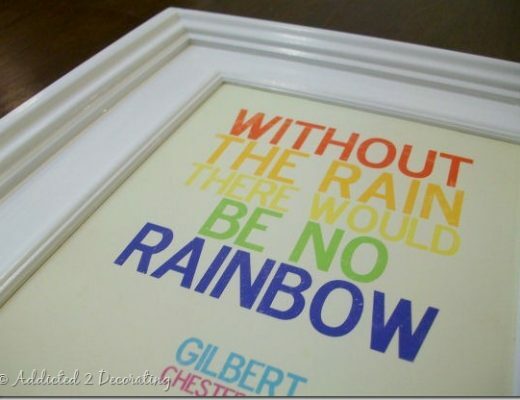 Wood filler – I use Elmer’s, and it comes in little tubs at Home Depot in the paint department. They recently changed their product, and it’s much better now. Caulk – I always use Alex Fast Dry latex caulk. It dries in about 30 minutes, so no waiting forever before painting. 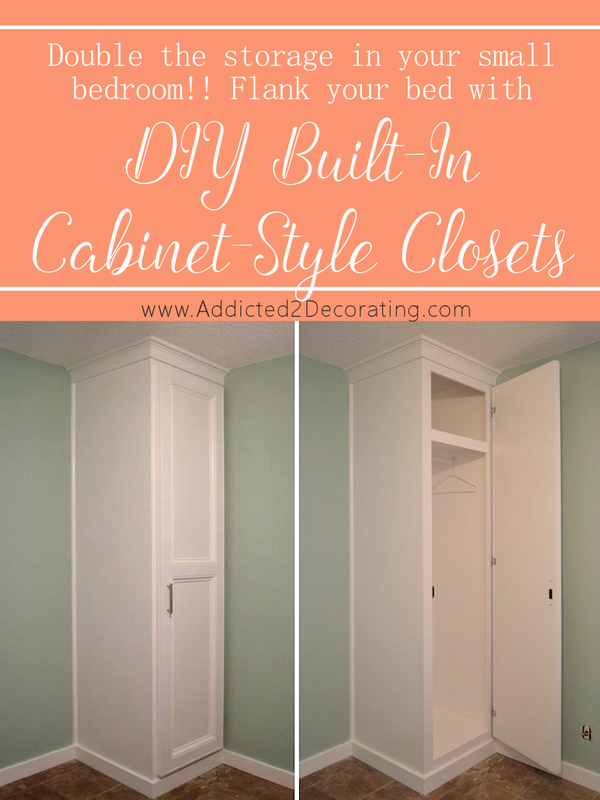 These closets look fab!! 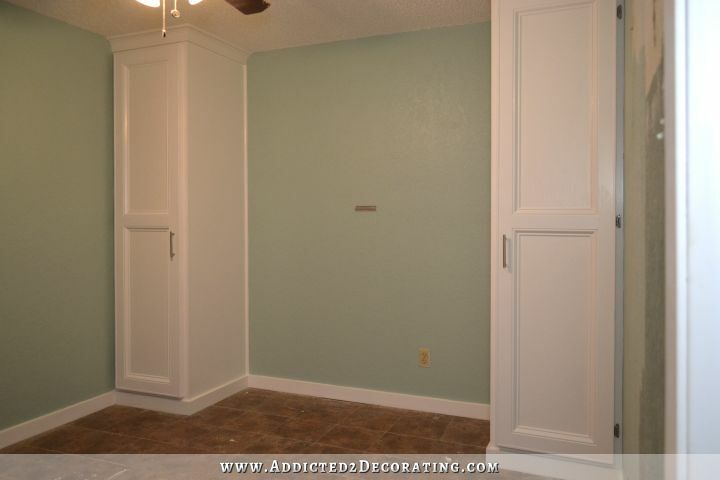 You chose a beautiful color for the walls too. They look perfect together! Kristi, are you selling the condo furnished? So whoever buys it can keep those things are not. It’s up to them, but I don’t want any of it. This is another good project. Looking awesome and pretty color combination.